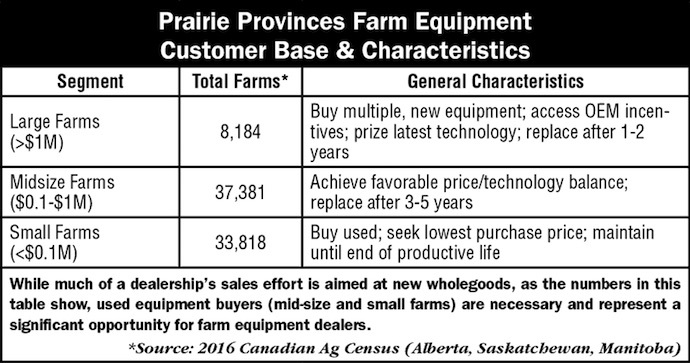 Rocky Mountain Equipment (RME) calls itself “Canada’s largest agriculture equipment dealer and the largest Case IH dealer in North America.” It considers itself a “consolidator” of agriculture equipment dealerships, primarily focused around the CNH Industrial’s agricultural brands. At its investors meeting at the end of May, the dealer group laid out a 5 year plan to grow the business by $500 million. Its expansion will include extending its reach throughout Canada’s Prairie Provinces and could even cross their southern borders into the U.S. Listed under the symbol RME on the Toronto Stock Exchange, the dealership group is one of only three farm equipment retailers that are publicly traded. 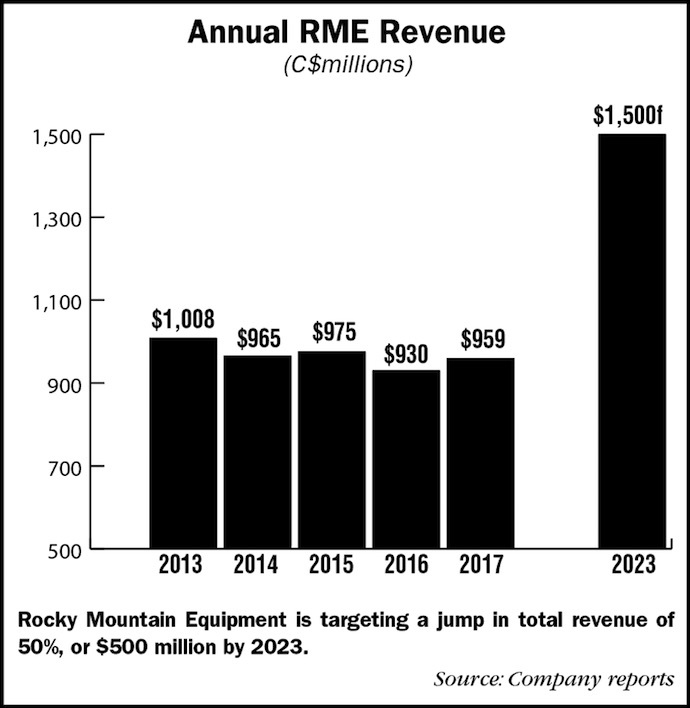 Since its IPO in 2007, RME has made nearly 20 acquisitions of other dealers, all in Canada. Like most of the ag equipment industry, the last few years were challenging for RME. Revenues peaked in 2013 at just over C$1 billion and bottomed out in 2016 at C$930 million. Last year saw a 3% increase in overall revenues to $959 million. Year-over-year gross profits were up 5% last year, to C$139.4 million. Sales in the first quarter of 2018 saw further improvement, reaching nearly $220 million, a 4.6% improvement compared to sales during the first 3 months of 2017. But RME’s growth strategy started with its right-sizing efforts. In addition to consolidating dealer locations, the company also focused on internal business operations. “Our management team determined early on that our SG&A needed to be less than 10% of sales.” Prior to that, he says the business had experienced “creep,” expenses continued to grow little by little until they were between 11-12%. With sales of about a billion dollars, a 1% savings represented a $10 million reduction in SG&A. In addition to initiating strict business disciplines and restructuring how the stores are managed, the major part of RME’s growth will depend on increasing revenues. But while the sale of farm machinery has seen some pick up in the past few months, a major turnaround isn’t anticipated in the near-term. As a result, in addition to the dealership group’s growth through acquisition, Ganden says they’ll focus on getting more of what’s out there. While some large dealership groups have ventured far from home — to places like Bulgaria, Romania, Russia, Germany, Australia and New Zealand — few, if any, have crossed North American borders. But RME is willing to blaze this trail at the right time. According to the company, RME’s Canadian acquisition efforts will be focused in Saskatchewan, acquisitions of Case New Holland-branded dealers in Alberta and Manitoba should also be expected. U.S. acquisitions will be focused in the Western regions of the country in areas with healthy crop receipts, a similar crop and equipment profile to the Canadian Prairies, and a healthy balance between crop and livestock production to balance exposure to any one type of customer. RME calls a U.S. acquisition “transformational.” It says it would help RME mitigate a number of risks including currency, crop, weather, political, transportation and tariffs through risk diversification. However, to give RME further growth opportunities in the U.S. market, it would need to find, retain or assemble a strong management team and back-office to serve as a platform for future growth. As a result, the first U.S. acquisition will be a scope acquisition and RME does not expect to achieve the same synergies expected of subsequent acquisitions. A large enough revenue base (approx. USD $100 million) to serve as a growth platform in the U.S. In addition to these criteria, Ganden says RME would need to be sure it is able to meet the needs of U.S. farmers. “We want to make sure that we go to an area that we’re able to provide the same quality of service that we provide in Alberta, Saskatchewan and Manitoba. We want to make sure that we are the difference maker for the customers, for the community, for the brands that we will represent. “And it is a heck of a challenge to figure out where is the right entry point, when is the right time. We think that the opportunity is great — to spread our geographical risk, that we have even more scale, which is going to enable us to take care of the customers better, take care of the communities better, and obviously support the OEMs.